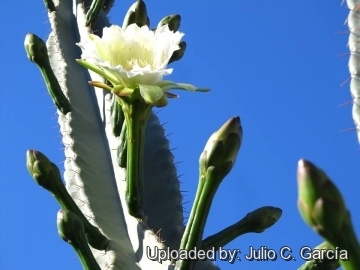 Origin and Habitat: Cereus hildmannianus subs. uruguayanus occurs only in Uruguay. Cereus peruvianus var. alacriportanus (Pfeiff.) K.Schum. 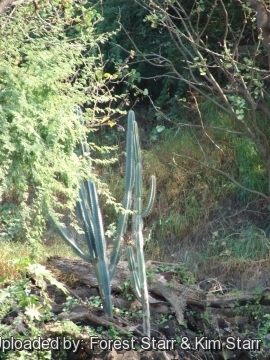 Habit: It is a perennial treelike cactus that grows like a candelabrum with numerous columnar branches, 5-10(-15) m high with distinct trunks. Stems: Cylindrical, segmented, bluegreen to dull green, often glaucous when young, to 15 cm in diameter. Ribs: (4-)5-6(-8), thin to obtuse, slightly indented, 2.5-3.5 cm high, rounded, green often with large yellow patches along the sides. Areoles: Distant, brown, large 2 cm apart. Spines:* Usually present, acicular golden-yellow to brown, six radial, rigid from 5-10 mm lomg, and only one longer (to 5 cm long) central spine and very pointed. Areoles at the top of the plant often have an increased number of spines, which are longer and with more wooll. Flower: Very large, nocturnal, elongated, funnelform, 20 to 30 cm long. Tube somewhat scaly, greenish brown without areoles and spines. Outer perianth-segments reddish brown, inner perianth-segments white, broad and obtuse. Ovary naked, 2.5 to 3 cm long. Stamens white, anthers yellow. Stigma lobes approx 15 clear yellow. Blooming season: It blooms at night in spring through summer. The buds grow quickly, shooting out from the branches like so many small snakes. Within two weeks, dozens of flowers open, always at night and all or nearly all flowers open simultaneously at the same time. By midmorning the following day, all had closed and drooped. This is apparently a water-saving strategy by cacti. The plant usually buds and flowers about two weeks following any warm-season rain. The fruits usually ripen within a month. Buds may erupt well into fall, even early winter, if sufficient temperatures and rains fall. During dry times, the buds often fall off prior to opening. Fruits globose: Pear-shaped, red with white pulp. 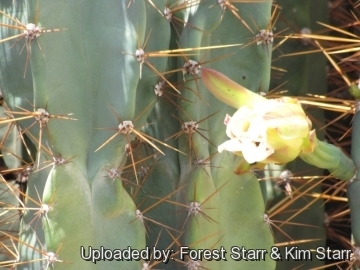 The Peruvian apple cactus may produce fruit 3-4 years after propagation from seed. Cereus hildmannianus K.Schum. : is almost always spineless. Distribution: occurs widely throughout the range of the species. Cereus hildmannianus f. cristata monstruosa: has irregular ribs and crested growing points. The plant grows into a tight bunch of twisted stems. There are several clones shoving different degrees of monstrosity. Cereus hildmannianus subs. uruguayanus (R.Kiesling) N.P.Taylor: is often spiny. Distribution: occurs only in Uruguay. 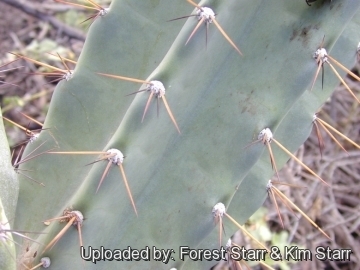 1) Forest & Kim Starr Cereus uruguayanus (Hedge cactus). Plants of Hawaii. <http://www.starrenvironmental.com>. Downloaded on 21 August 2014. 2) Braun, P., Larocca, J., Machado, M. & Taylor, N.P. 2013. Cereus hildmannianus. The IUCN Red List of Threatened Species. Version 2014.2. <www.iucnredlist.org>. Downloaded on 23 August 2014. 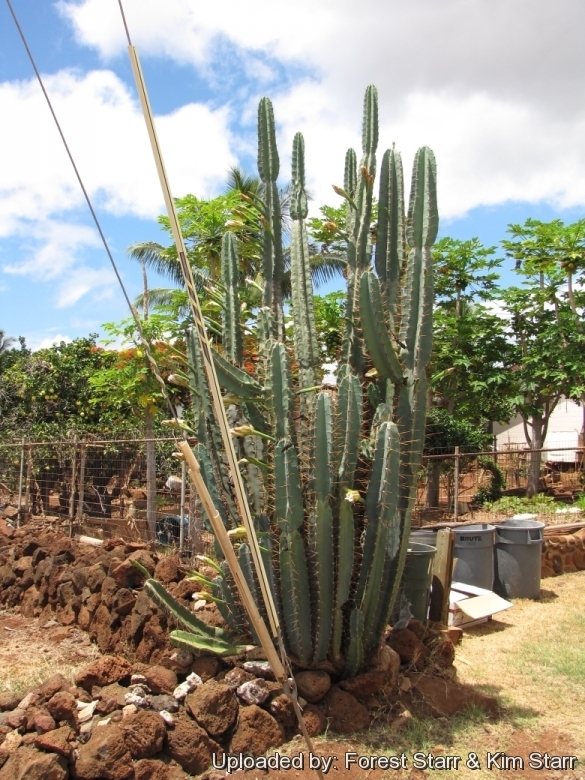 Cultivation and Propagation: Cereus hildmannianus subs. 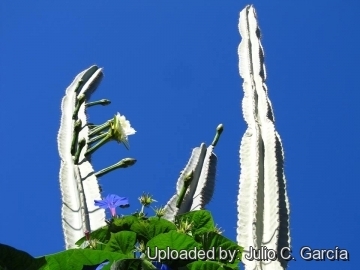 uruguayanus is well known to cactus fanciers throughout the world. It is very easy to cultivate, easy to propagate, tolerates moderate frost, and produces numerous showy white flowers 15 cm across. It is one of the most widely cultivated cactus species. The fruits are edible, and it is used for living fences. Even more intriguing, the apple cactus is widely touted as having the power to correct physical ailments caused by electromagnetic radiation. How and why this particular virtue was discovered are unclear, but the plant is widely sold potted with the recommendation that it be located near a computer screen or television in order to re-establish an electromagnetic equilibrium upset by the device. Or some such thing. Food uses: It often produces more than one hundred delectable fruits each year, all of which act as bird magnets. The fruits are edible and can be eaten fresh, dried or made into a juice. Once harvested, the ripe fruits must be eaten within twenty-four hours, or they begin to ferment. Experimental growing of the plants in the harshly dry Negev Desert of Israel has proved promising for fruit production. 'Plants irrigated with freshwater produced more than 20 kg of fruits only six years after planted as cuttings. Other uses: The cactus is cultivated for use as a living fence. To make a fence people break off the straight lateral shoots of the height required and plant them closely side by side in a trench sufficiently deep to ensure their standing firmly. A hedge perfectly impassable is obtained at once the cactus rooting so readily that it is rare to see a gap. 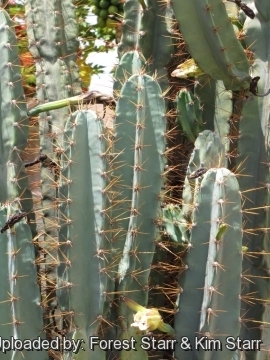 Slow growing and delicate cactus species can be grafted on Cereus hildmannianus root stocks to provide faster growth. Propagation: From cuttings in spring (let them dry till the ends callous well). Then replant them in fresh cactus soil that is ever so slightly moist, and keep them that way till they root), or by Seeds (Seeds should be sown in a well-drained soil mix. Surface sowing is the best; seeds germinate in 14-28 days at 25° C . The seedlings should not be disturbed until they are well rooted, after which they can be planted separately in small pots. The cuttings grow rapidly into a tall columnar.